August 11, 2016: Mahindra Blazo 40 Tip-Trailer is the tractor tipper category truck offered by the company under its all new SmartFuel Blazo range with GVW of 40,200 kg. It comes fitted power steering and has decent gradeability of 27% to conquer the rough terrains. It’s backed with engine specifications of mPower FuelSmart 7.2 Litre 6-Cylinder BS-III motor, churning out 260 bhp and 960 Nm torque. It can be used at construction sites to carry stones, gravel, cement and as well as to carry metals, ores, coals, etc. at mining sites. The sleeper cabin comes with features like optional AC, telematics, driver information display, adjustable driver seat and others. 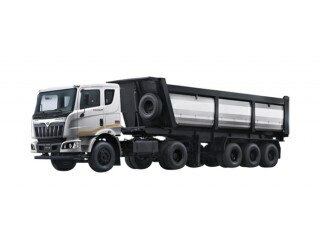 It’s available in one wheelbase option of 3,600 mm and with trailer body option only.